The Zelda franchise is beloved by many. One of the aspects of the franchise that really resonates with me are the expressions given by our protagonist. Link is a character of many talents and is full of courage, wonder, innocence, frustration, laughter...the list goes on and on. What does he say, you ask? Why, he hasn't said a word! We see who he really is by his actions and by plainly looking at his face. Here's my own list of notable expressions. Sorry to spring this creepy transformation pic on you so soon. The transformations within Majora's Mask portray a quick and extreme cut scene that catches the player off guard the first time through. Majora's Mask has been regarded as one of the darkest Zelda iterations. This screaming cut scene adds to the mood of the game. LOL! The first time I saw this expression within Twilight Princess I was dumbfounded. Really! Link is so excited to walk into a fishing bait shop that he gives off an ecstatic and utterly goofy face. I haven't forgotten ever since. 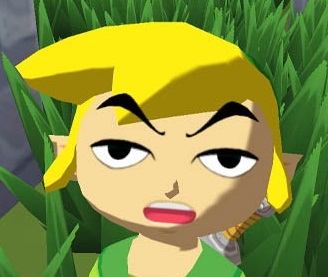 One of many of the wonderful expressions shown in Wind Waker. 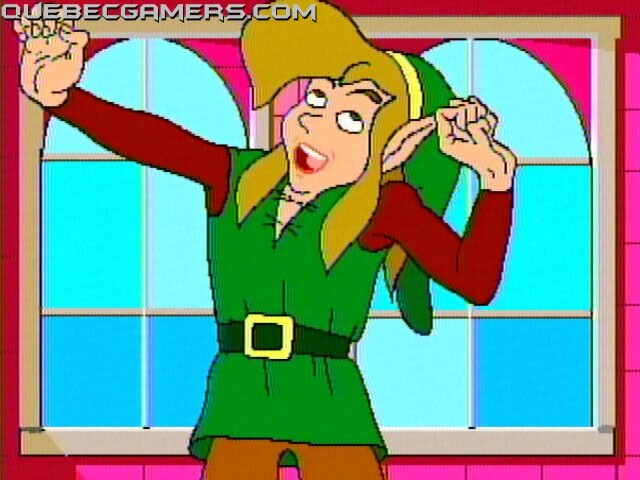 One of the great advantages of having a cartoon style Link is that the expressions can and will be exaggerated. This one is shown early in the game and that's only the start! This one's a no brainer. Every Zelda player celebrates (at least in their head) when Link cracks open a treasure chest and raises that shiny new item above his head. If you look closely he'll have a slightly different expression based on the item. Rupoor anyone? Opening the dungeon doors, feeling the heat of burning lava rise up through the air, taking a deep breathe, and continuing in your journey down the stairs. What a great and confident expression our hero has! Most of Link's adventures center around saving the princess but not until Skyward Sword have we really seen the tension and love between them. Their flight through the sky that ends tragically is filled with smiles and gazes that warm the heart. One of the silliest moments in Wind Waker has to be the entry into the Forsaken Fortress. The scene is composed of pirates, a boy in a barrel, and a catapult. For a second I thought I was playing Monkey Island. I can't imagine these types of expressions on any other style of Link. Twilight Princess really showed off a nice use of facial animation. The first time Link smiles at a friend the player really feels the love. If you didn't you may need counseling. By now you must know that I love the expressions found within Wind Waker... So you've never been away from home and you're sailing away. As you wave goodbye to your friends you see your weary grandmother looking out from your home. You rush to the stern of the ship and give her a final wave. I have to admit, my lower lip may have been quivering. 3D Zelda games really benefit from expressions. Not only to show emotion but to show reactions to your surroundings. One of the first trailers of Ocarina of Time showed off this ability. 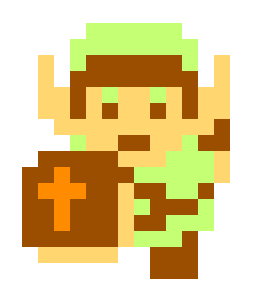 Link was able to walk into a room and seamlessly show the player where there was something amiss. One of the features thats still used to this day! So what's next? How will they effectively express Link's emotions? Ok, do the top ten link sound effects next! You didn't include this one? But he is clearly trying to tell us something here. It's like he figured out the meaning of life and is trying to impart it to us directly through his eyes. But are we willing to listen? That sprite equates to your current facebook profile pic. 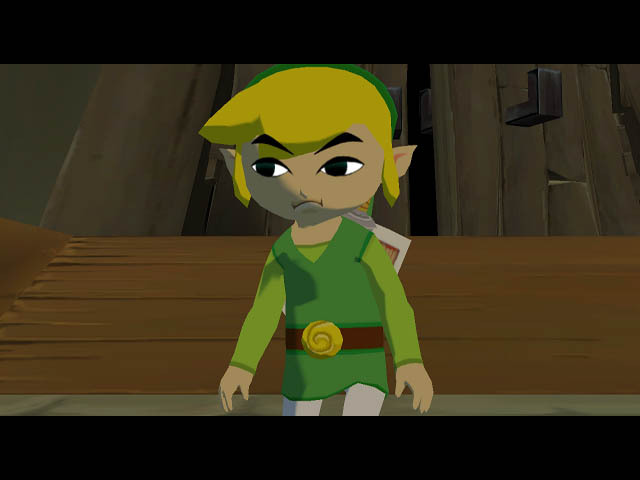 Wind Waker definitely displayed some of Link's best expressions, and it happened to feature my favorite. 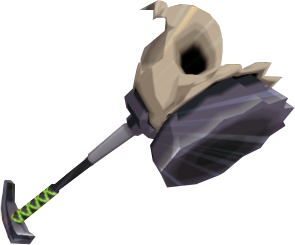 I couldn't find a picture of him using it, but the look on his face every time he swings this hefty hammer is beyond priceless. It's the reason I hoped to see Toon Link use it in Brawl. Cool list! I love Link's different expressions and how each art style has handled showing his emotions in fun and powerful ways. #9 is hilarious, I didn't remember that one! I kinda just figured they were all gonna be Celda Link expressions. I'm pretty sure he's flipping us off. Cannot believe there were no CDi faces in here, or any from the TV Show. Disappointing. 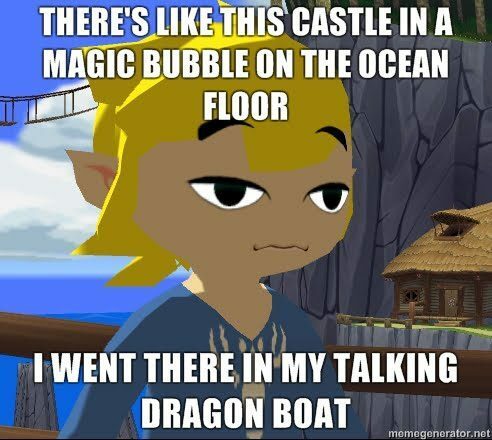 Wind Waker had some of the best expressions, agreed! Nice list. #10 and #4 are best from this list. I also love when Link looks around too, in all 3D Zeldas. Looks great.